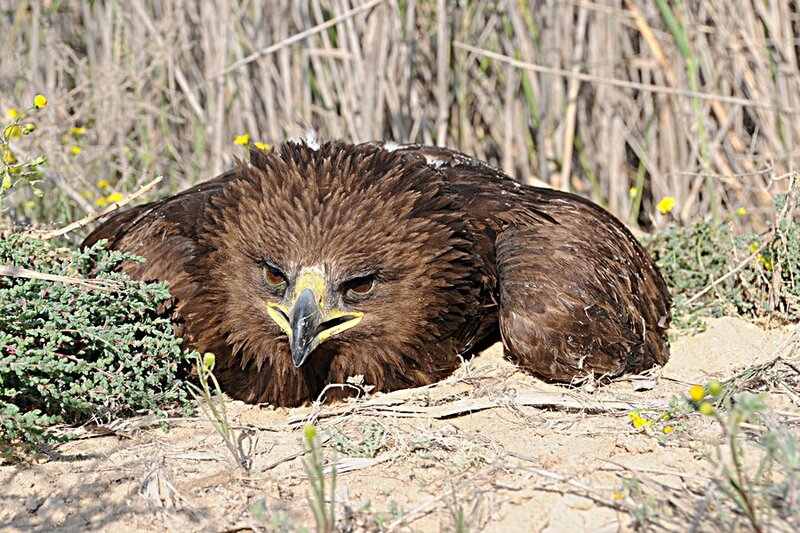 A trip to Sabkhat Al Fasl at the weekend produced nine Greater Spotted Eagles which is equal to the highest count I have had at the site. Six birds were 2nd calendar year birds and the other three sub-adults. I found one bird on the ground and very unusually I was able to get quite close to it. On looking at the bird through binoculars it was clear the bird was not in good condition. This coupled with the fact that I was able to get close the bird made me worry about the health of the bird. I stayed some distance away from the bird but when a security car drove close by it, it became apparent that all was not well as the bird tried to fly but only managed to flap about. I then got out of the car as the bird had managed to struggle into some water and looked like it was going to drown. I caught the bird by hand and put it on the dry ground near to the edge of the reeds and took a couple of photographs of it. Although it was sick in some way there was no obvious sign of anything wrong. I assumed the bird had been shot when I first saw it in poor health as there were quite a few hunters around that day although I could not find any blood or marks suggesting this might have happened. 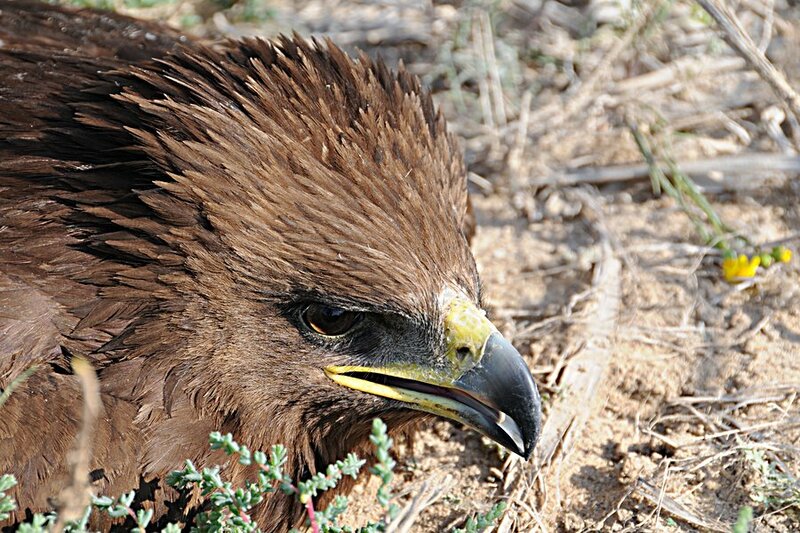 When I picked the bird up I was very surprised how light it felt, although I have never had a Greater Spotted Eagle in the hand before to judge this by, so maybe it was sick due to lack of food? There are no bird hospitals in Saudi Arabia to take sick and injured birds to so I left the poor thing by the reeds in the sun to dry out and hopefully get better. After birding the site for a couple of hours I returned to the place where I had left the bird to see how it was and although it was still in the same place it was now dry and looking a lot better. 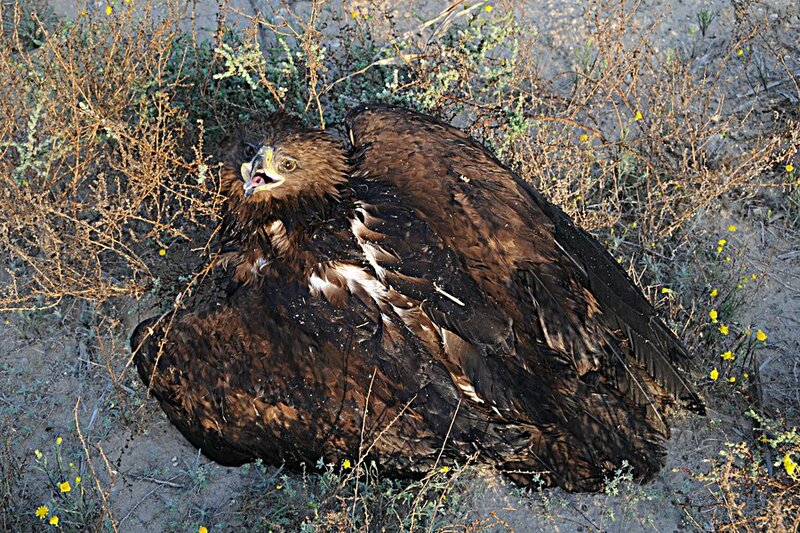 I suppose it was not going to be a happy ending for the eagle but let's hope. I've been told that there is a rehabilitation place for birds, near the Princess Noura University. Don't know exactly where, but certainly the person telling me was taken inside and shown birds of prey that were being given medication. The shots were expensive so I it could have been private. Thanks Countrygirl - if you find out any more details please let me know and I will post them on the website. 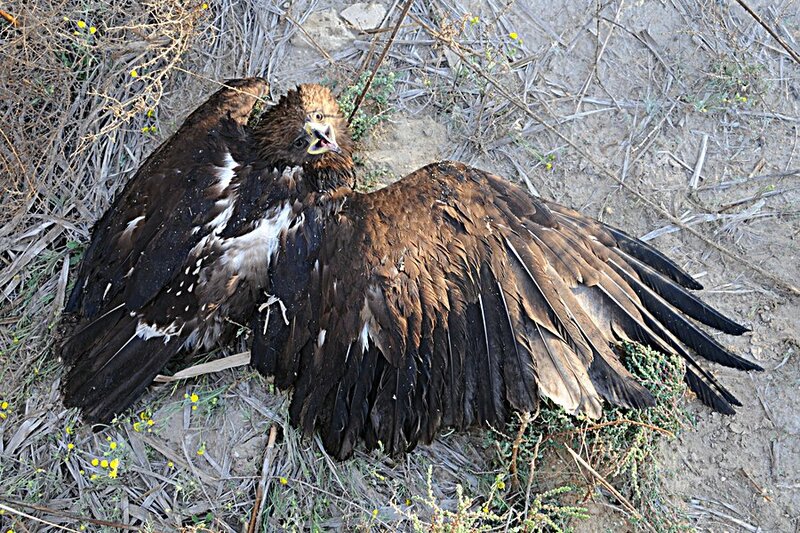 Another possibility for rehabilitating birds of prey in Saudi Arabia may be form people who keep falcons to hunt with? but I do not know any of these either.